UPDATE: It's a pet peeve, but I don't like reading a blog post about how someone starts a new venture. I want to hear how it turned out, as well. So scroll down and see the rest of the celery story. This was one of those times. 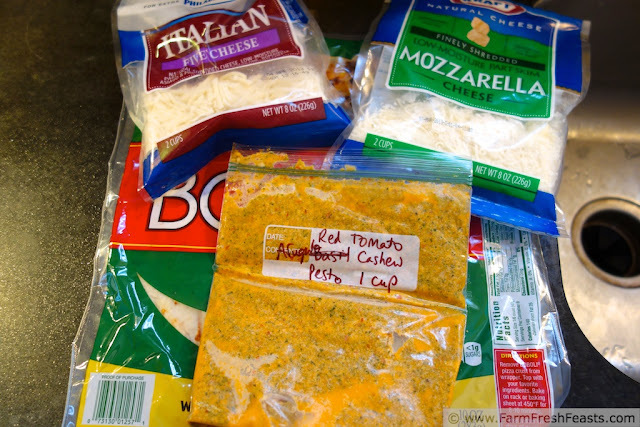 No pizza dough in the house, though I had plenty of sauce, cheese, veggie, and meat topping choices in the pantry and freezer. Had I hit Trader Joes, I would have picked up some of their bags of pizza dough. But our beer/milk/eggs run took me to the rare grocery store that had no pizza dough. Not in the deli. Not in the freezer section. Ok, pre-baked crust it is. If you have a pathological fear of uncooked pizza dough and will only use a prebaked crust such as Boboli®, rock on. 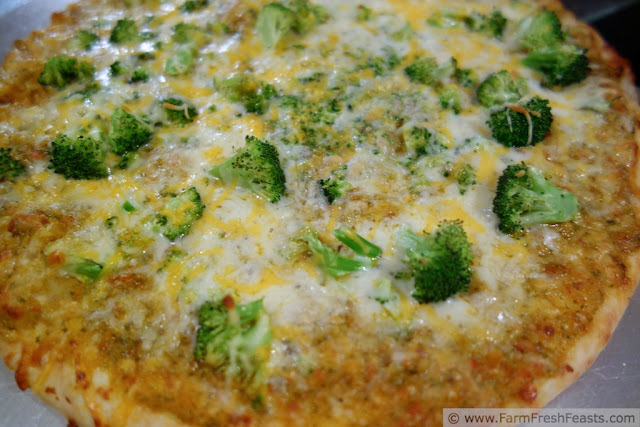 You too can make amazing pizzas using ingredients from your CSA farm share. Because we love pizza here on Friday nights, I bought 2 Boboli® and made 2 pizzas. (And will write 2 blog posts from 1 meal). This one is the kiddie pizza--because during the grocery store run, while not finding dough, I found a marked down bag of precut broccoli florets. Ok, so the Italian cheese didn't get used and I forgot the broccoli in the photo. Eep! Preheat oven to 450 degrees Fahrenheit. Preheat on medium heat a small skillet with a dab of oil in it. Sauté the broccoli until bright green, about 3 minutes. Set aside. On a plain old ordinary piece of parchment paper, no oil needed this time, spread tomato pesto across the Boboli. Top with broccoli. Scatter cheeses evenly across the top. Bake 8-10 minutes. Cool, slice, and serve. Ok, now for your late winter, when is spring coming? bonus: next time you finish a bunch of celery, stick the end in a shallow dish of water. Bonus points if the dish was hand-selected by your spouse when you lived in Japan (and has crossed oceans a few times without breakage) and if you're using rain water. In a few days, you'll notice the center getting taller, like the one on the right. 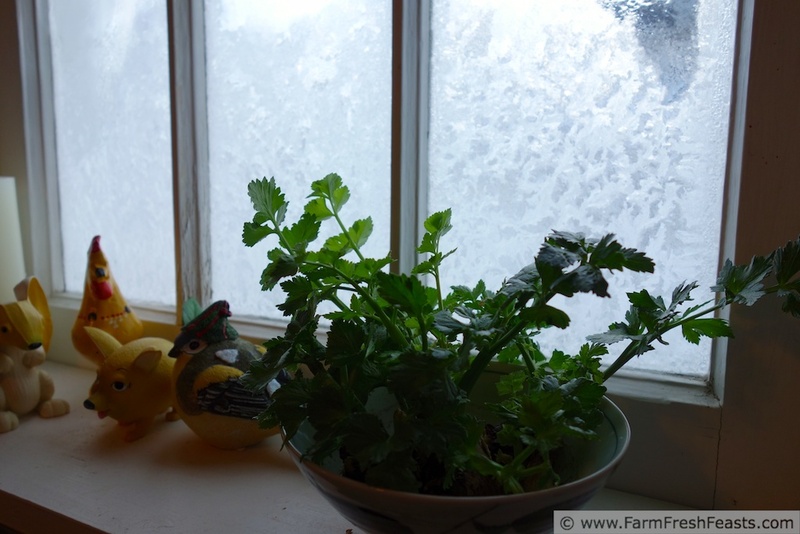 Then, if you don't forget to water it, your celery will grow and grow, forming roots and multiple branches. Yes, it was cold enough for ice on the inside of my kitchen window. I could feed these branches to the composting guinea pigs, but I decided to keep growing them and transplant them into my garden come spring. They did amazing! I thought the varmints would go after them, but they chose my tender dill, fennel, and parsley instead. I'm harvesting celery by the handful! I have no experience with celery in a container, but my guess is that with good soil and good drainage, celery will grow in a pot. If you try it, let me know. Simon photobombs again. After standing in front of me, barking at squirrels, he finally lay down. 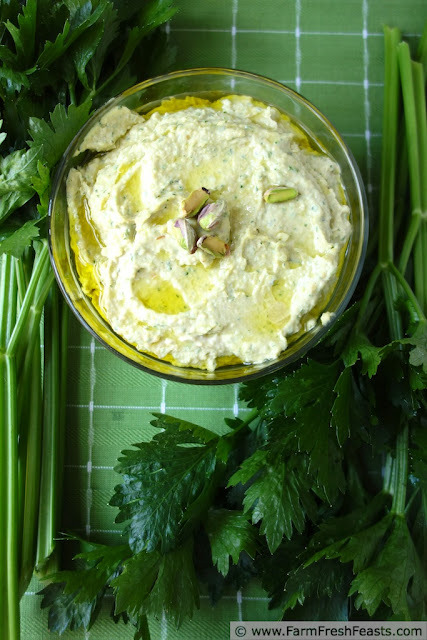 My re-grown celery makes a great dipper for hummus with garlic scape and basil pesto. This post is linked up with the Farm Girl Blog Fest at Let This Mind Be In You, the Creative Homeacre Blog Hop at Self Sufficient Home Acre, with What's Cookin Wednesday at Buns In My Oven the Wednesday Fresh Foods Link Up at Gastronomical Sovereignty, What's In The Box at In Her Chucks, Green Thumb Thursday Food on Friday and Taste and Tell Thursdays. That pesto on the pizza looks amazing! I've never made a tomato pesto, but now I'm intrigued. Thanks! Check out Heather's recipe--it's foolproof. I've made it with yellow tomatoes, red tomatoes, Indigo Rose tomatoes, with almonds and cashews, with basil, arugula, or parsley. It's all good. The trick is to put it where you will see it every day (kitchen or bathroom?). I lost my first bowl, started in October, because I missed watering it when it was droopy and it was too far gone by the time I got 'round to it. Now I err on the side of caution and water when it's sort of getting lower but not really down to the bottom. I'm glad you stopped by! I learn so many cool things at Farm Girl that I'm glad to share a new good thing with someone else. I think the pizza looks great! I'm not the biggest broccoli fan, though I'm working on overcoming my aversion. I'm sure your pizza will help me with it! 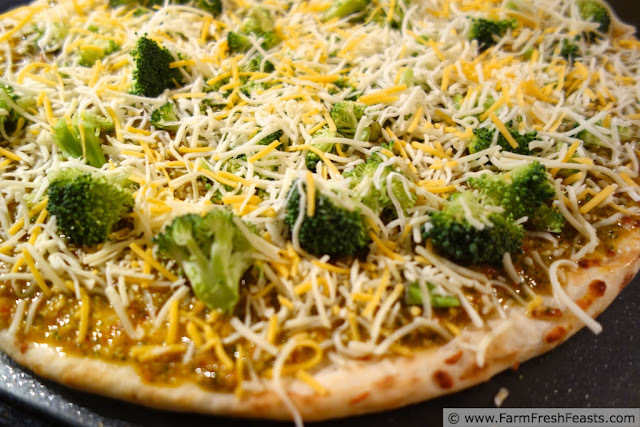 There's too many veggies in the world to stick one you don't like on a pizza! Though if you want to overcome your broccoli aversion, I suggest bacon . . . I want your fresh tomato pesto. I an not crazy about broccoli, but I do like broccoli raabe. I just joined the farm fresh fruits/veggies, herbs delivered to your door plan. My first will be delivered next Thursday. I wonder what surprises I will have in store for me in the kitchen. How fun for you! I love the challenge of figuring out what to do with all the good stuff. Broccoli rabe would be great on this pizza too. Maybe pizza next week, and maybe something different than our old standbys. Thanks for the inspiration! I happen to have a bunch of celery in the fridge, too. Might need to use it up so I can grow the root end. How long has yours been growing? It looks so cool! 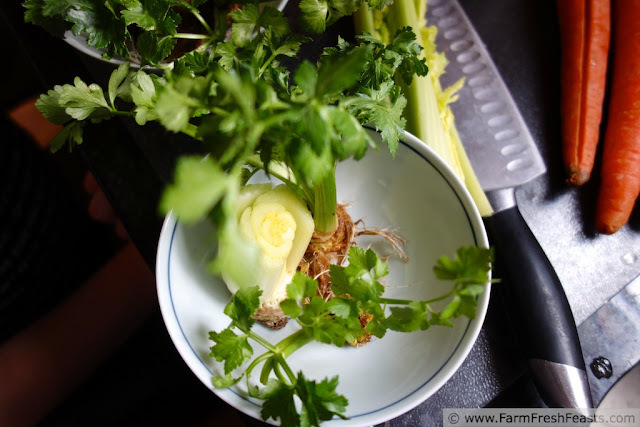 I love, love, love celery leaves, but the ones on the grocery stalks often are nasty. Now I can grow my own! Thanks for the tips! The celery in the photos has been growing I'd guess close to 2 months. You see how cold my kitchen can get, so I am sure it's growing more slowly than it would in a warmer environment. Just make sure you have it where you can see it--when it wants a drink of water, it wants one NOW! That pesto does look amazing - it's going on my summer to-do list this year! 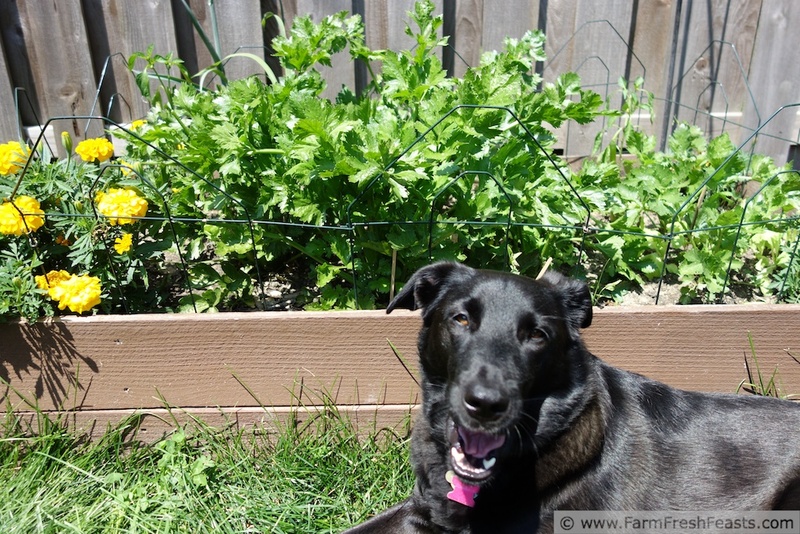 Your rooted celery looks great - I've done that as well, and we actually just ate it, rather than save it for the garden. Garden grown celery has a stronger flavor than the store bought stuff - unless you go to the trouble of blanching it in the garden with straw or something to keep it whiter and milder. Unblanched it is kind of like gigantic parsley which is not a bad thing at all! Thank you for echoing what I'd been thinking since we started getting celery in our CSA share. I knew that home grown tomatoes and strawberries tasted . . . MORE . . . compared to their store-bought cousins, but flavorful celery was a revelation to me. Heather's Cherry Tomato Pesto is really awesome--I've done it with several different types of tomatoes, several types of nuts, and several types of leaves. And each time it comes out great! I have been wanting to start scallions and celery but my house faces West and my kitchen is kind of dark. That is awesome! I've never done scallions, but I do start my garlic and shallots in the fall, by Thanksgiving, and harvest before mid-summer. The celery needs to be in a window where you'll see it (maybe a bathroom?) because it gets thirsty. My kitchen faces East and is so nice and sunny on a winter morning (and so hot and sunny in the summer!). Make it a once a month event--otherwise your loved ones start expecting it, demanding their Friday night pizzas! Good thing I find it inspirational! I do in fact still have celery left so I'm going to give this trick a whirl. I have done it before with green onions so why not celery. I'm not sure how, but you even make Boboli look fabulous, although you're right, they are ridiculously expensive. I get frozen dough balls at my grocery store for $1.99, and they are from a local bakery. Win, win in my book. Total win in my book. If you can't find balls of dough in your freezer, unlabeled who knows what's in the balls of dough, like in *my* freezer, then the local bakery wins every time. 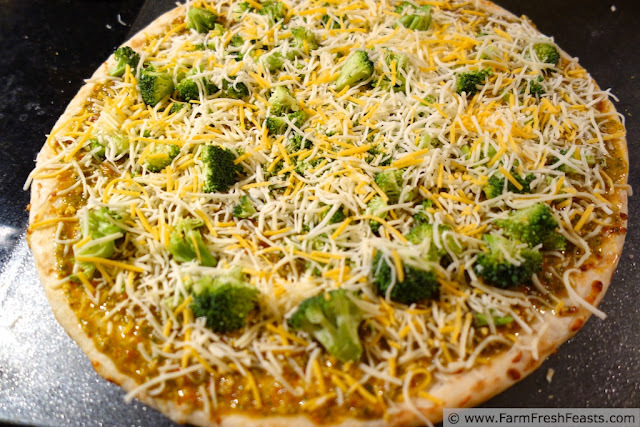 Ooooh broccoli and cheese pizza!! YUMMO! My husband loves the Boboli crust. 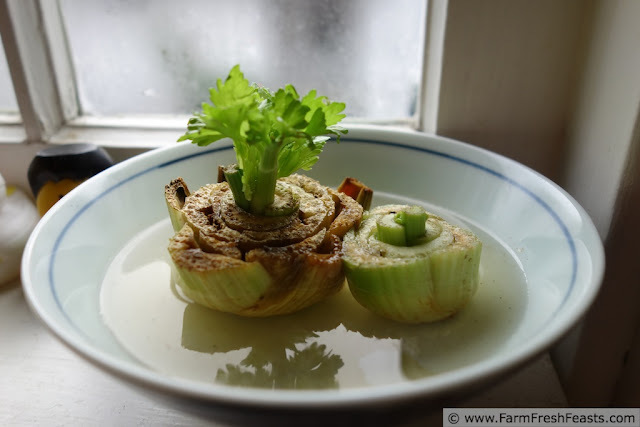 Your rooted celery looks perfect! Next month, it's Boboli with mushrooms, which I liked even better than this one. Though I still think it's silly expensive for flour, yeast, water, salt, oil and cheese. It was recently brought to my attention that, although the narrow windowsills in the modern-day suburbs stink!, I had never rooted a carrot etc for my kids to watch take root. Even though the boys are 12 and 17, not wanting their childhood to lack those key memories, one evening in the kitchen I grabbed a 12-inch skewer and jabbed it through the centers of 2 celery ends, one red cabbage end and a carrot end. I pulled out 2 Pampered Chef prep bowls, put water in them and popped the ends of the various veggies into the water. A couple of days later, we had tiny green leaves popping out of the celery clumps, a tiny red leaf coming out of the cabbage end, and a dried up shriveled carrot leather, where the water evaporated below the level of the carrot! Now, the others are going crazy! Hard to believe you are doing the same thing at the same time!! Who knew??!! I've made carrot leather too. I really wondered why I was trying to grow a root in a shallow dish. I mean, the celery grows up and out, you know? What else can the carrot do? PS did I mention how tricky it is not to swear in front of the kids when you spill and re-spill t he water in those darned l little bowls? It's possibly why I fill the water bowl before they wake up in the morning . . . I love it! 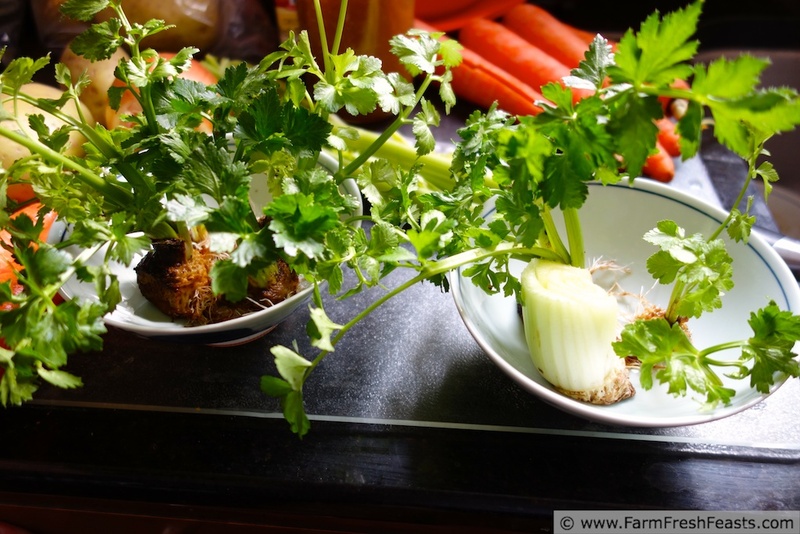 I have some celery I could use right now and put it right next to my indoor growing green onions! What with the lettuce re-growing on your hop, we could have a whole Regrow Your Salad party! I'm amazed at the wealth of things there are to learn in the world. I appreciate the follow, even though I'm still not quite sure what this means. Thank you for the invite to your blog hop--I'll check it out! I'm glad you all liked it--thanks for letting me know!